You know that friend whose cute animal farm I showed you around the other day (and who sold me my original flock of sheep back in 1995, which means I've been calling her with sheep questions ever since)? I don't get to see her very often, but whether I'm visiting her farm, she's visiting mine, or we're meeting someplace in between like the livestock sale barn, I make sure to have plenty of treats. She loves my homemade bread, squeals if I show up with a bag of Baby Chocolate Chip and Toffee Shortbread Cookies (and she's not the squealing type), and will spend several hot and sweaty hours helping me work my sheep in exchange for a homegrown lamb salami sandwich, some Blueberry Peach or Apple Blueberry Streusel Bars, and a café mocha made on our little commercial espresso machine (the best birthday splurge ever). But what she really goes crazy for are these Raspberry Almond Bars. Are you always on the lookout for a quick and easy, foolproof dessert recipe that transports well, won't melt in the heat, freezes beautifully, holds up to holiday shipping, doesn't require lots of oven babysitting, can go from potluck picnic to dressy dinner party, is made with common pantry ingredients, and never fails to garner rave reviews no matter who you serve it to? People get so excited over these bars it's almost embarrassing to admit how easy they are to make. You use one batter for both layers, and the filling is simply jam. And when I say foolproof, I'm not kidding. Underbaked? Still good. Overbaked because it was 11:30 at night during lambing season and you fell asleep a few minutes before the timer went off? No complaints. Didn't grease the pan? Not to worry. Forgot a couple of bars in the hot car for three days? Gobbled right up. I've been making these for years. One large egg and one egg yolk will give you a crumbly dough that you can easily pat into the pan and sprinkle on top of the jam (as seen in the top two photos). Two large eggs make a softer dough that will give you clumps of topping and allow the jam to show through (as seen in the photo above). I like both versions, but the softer dough is a little harder to work with. Experiment and see which you prefer. You can use any flavor of jam you like for these; we're hooked on Trader Joe's organic reduced sugar jams, but if you're lucky enough to have some fresh raspberries and one minute to spare, you could make your own jam. You can also swap whole wheat flour (I have the best luck using white whole wheat flour in baked goods) for some of the all-purpose flour. I like raspberry jam the best, but whole wheat with apricot is very nice, too. If you can't find toasted sliced almonds, just toast raw ones in the oven for several minutes while it's heating up. As always, I urge you to seek out organic and local ingredients. They really do make a difference. Place the butter and sugars in a large bowl, and use a hand held mixer on high speed to cream them until light and fluffy, about 2 minutes. Beat in the egg and egg yolk (or two eggs) and almond extract. In a small bowl, combine the flour, cinnamon, salt, and baking powder. With the mixer on low speed, gradually add the flour mixture to the butter mixture, then mix or stir in the almonds. Use your fingers to press half of the dough into the bottom of the baking pan. I use the bottom of a stainless steel 1 cup measure to evenly pat it out. Put the jam in a small bowl and loosen it up with a small whisk or a fork (this will make it spread easier). Spread the jam evenly over the dough, leaving about a 1/4-inch border around the edges. Sprinkle the remaining dough over the jam, all the way to the edges of the pan, and then press on it gently to form the top layer. Bake until the top is golden and the edges are starting to brown, about 35 to 40 minutes. Cool completely in the pan, and then cut into whatever size bars you like and serve. The bars will keep for at least three or four days at room temperature, or you can freeze them. I wrap them individually in plastic, then toss them all in a zipper freezer bag. © FarmgirlFare.com, the not afraid to use every barnyard animal trick in the book foodie farm blog where despite the whole endless hard work/very low pay thing, farm life really is worth it—and although our darling donkeys can be stubborn, if you just shake a bucket of treats in their direction, they'll happily follow you anywhere. 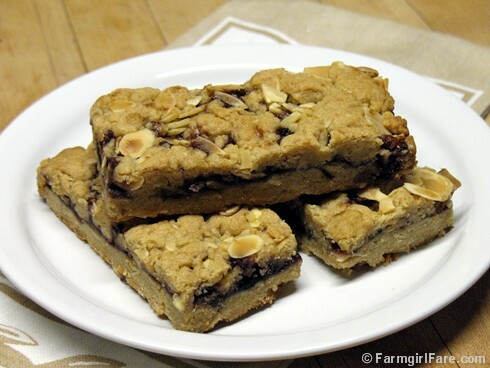 Funny, I was just thinking of making a red raspberry version of your blueberry breakfast bars and thinking how good some slivered almonds would be on top. This looks lovely, too, and a little easier, even. I think I've decided that BB bar recipe is the reason I never seem to lose weight in the summer, despite lots of garden labor, fresh vegetables, and bike rides. It works so beautifully with whatever fruit is fresh at local farmer's markets. I think that I love you! I've been following your blog for a couple of weeks now--no idea of how I found you--but this is the first time that I've had the urge to post a comment. I love the blog and everything that you share. It's a wonder. But what I really love you for today is the recipe. You have given me a gift of knowing what to do for my Dad for Father's Day. They look fantastic and delicious. I'm going to try making them next week. Thanks for the recipe. The bars sound delicious, love those raspberries! Yum! Yup. Without their corn addiction, our sheep would be about as herd-able as deer. I would love to try making this with mulberries. Anything to use up more mulberries. Although I'm the only one in the house that eats flour-based foods, so I would have to eat them all myself. And I think maybe that wouldn't be a great idea. Plus, it's way too hot to bake right now. Maybe later in the week . . .
& if you also need a chocolate fix why not just sprinkle a handful or two of chocolate chips on either the jam or the crumb topping. As if these weren't delectable enough...now a wonderful suggestion of sprinkling a few chocolate chips on top - What a great idea!!! Bloggers and their readers are amazing!!! Have I mentioned lately how much I love your site?? No??? Thanks again for sharing so much of your farm life with the rest of us. Too bad we can't all come over and help out a little bit - you truly deserve some help for all you give to us. Awesome! I just made 6 pints of no-cook freezer jam this weekend. These bars will be a great way to use that jam (we aren't so big on toast, but I was over-zealous at the U-Pick farm this weekend). And BTW - I am so grateful that you rant about jam with too much sugar. I made jam with 4c mashed berries and 1/2 cup sugar. The recipe called for 4 cups - Insanity! (Not to mention impossible, since didn't have that much organic sugar in the house). If you haven't made freezer jam, it is awesome & requires no cooking. I made these, and boy! they were delicious! I didn't have any brown sugar, so I reduced the sugar to 1 C, then added a little bit of honey instead. Also, I didn't have any almond flakes, so I used rolled oats. I spread the jam, and added blackberries because there wasn't enough jam (and I used whole wheat flour) WOW! they came out delish! This recipe is an absolute blessing, thank you! so happy I found this blog through wash wednesday. I am most certainly making these raspberry bars, as I just made 6 quarts of raspberry jam. cannot wait to check on some of your other recipes. Oh my these look so delicious, I can't stand it!! I might have to hold off that diet I was about to start! Lucky thing I found you now! What a wonderful blog you have...I am really enjoying myself looking around! soo yummy, bringing them backyard ca,ping this weekend. Mmm these look so delicious! Thank you for sharing! HA! Amen! That list sums it up. And those bars look delicious! I made these last night... using gluten-free baking mix instead of flour, applesauce in place of butter, and I added about a cup of white chocolate chips. Yum! Thanks for sharing! Excellent! Thanks for the recipe. Hey, made these and had to give 3/4 of the batch away to neighbors and golf buddies, to avoid EATING THEM ALL MYSELF!!!! YUM! Made them with two eggs, see what you mean about the texture, will try the one egg, one yolk style next. You are a goddess!!!! My girlfriend Gina made these bars for me this weekend and they were amazing!!! Definitely going to pass this on to my other friends. Thanks so much! I just made these (after staring at them on and off for weeks) and let them cool while I put my son down to sleep. Came out and cut a tiny corner out to see what they taste like --- and ended up eating the entire "row"! At least it was the 9" side and not the 13", but the night isn't over. I mixed half raspberry and half blackcurrant because I didn't have enough of either, and they are AMAZING. I also used half whole wheat and half AP flour, and used 1/2 tsp vanilla since I didn't have almond extract. Thank you SO MUCH for this recipe, so much better than the krusteaz mix! Haha. Simple recipes that taste great are always prize winners! These sound yummy, though I may have to use blackberry jam this time as we are swamped with wild blackberries just now. I made these for my in-laws church homecoming this past weekend and they were a hit! Super easy to make and so good too! I have been enjoying your recipes. These are amazing! So delicious and easy to prepare. Since you like Swiss Chard as I do, I thought you might like Deborah Madison's recipe for a Provencal Swiss Chard and onion omelet named Trouchia. Recipe:http://www.epicurious.com/recipes/food/views/Chard-and-Onion-Omelet-Trouchia-358311. I love your blog! I'm an urban farmer with a vegetable plot in Washington DC, which I "farm" with a friend. I have some fruit trees on our little piece of heaven in West Virginia. I get so much good advice from your blog. I want to try this with oatmeal instead of the almonds -- has anyone done this? My kids aren't huge nut fans, but I am not a good baker so don't know if I could just substitute the oatmeal or if I would ruin the consistency. Guess I'd better stick to the "known" first time out, right? I would try using maybe just 1/2 cup or 3/4 cup of old-fashioned oats in place of the 1½ cups of almonds, because they'll probably change the consistency of the batter. You could also simply leave the almonds out, though you might need to use a smaller pan (like a 7"x11" or a 9"x9") because the batter won't go as far. 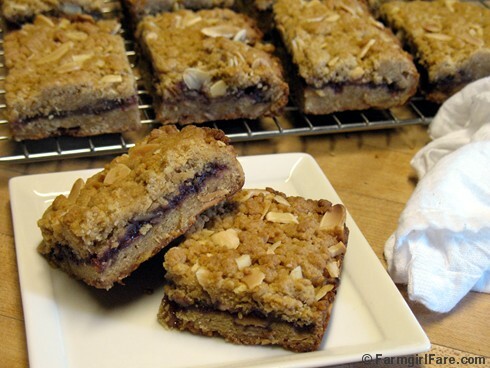 Or you could try my Easy Blueberry Bonanza Breakfast Bars instead. 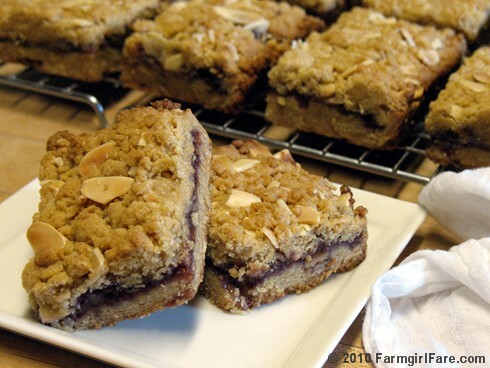 They have an oat crust, streusel topping, and no nuts. There are blueberry peach and blueberry apple versions included in the recipe as well. Years after I bookmarked this recipe, I've made it twice in two weeks. It's so delicious, and everyone wants the recipe. Thank you!! !